By law, Michigan drivers must buy first-party medical insurance or Personal Injury Protection (PIP). In the event of an accident, PIP covers all medical expenses for the policyholder, other drivers listed on that policy, and all relatives who live with the policyholder. It doesn't matter who causes the accident, health care providers charge each auto insurer for their own policyholder's costs, hence "no-fault" PIP. No-fault PIP was originally introduced country-wide as a fair and quick method to ensure physicians, hospitals, and health care providers who treated persons injured in a car accident were paid in a timely manner. Previously, those providing medical care would have to wait to receive payments until a lawsuit determined who was at fault in the accident. Under the new no-fault PIP coverage proposed in the 1970's, the legal concept required insurance companies to pay for their own insured driver's medical bills, regardless of who caused the accident, and prevented the insurance company of the innocent victim from seeking any recoupment of the medical costs from the negligent driver or their insurance company. Michigan was one of a handful of states that believed in this legal concept and, in 1972, passed the current no-fault PIP laws used to govern payments for the medical treatment of people injured in car accidents. In October 1973, Michigan's law went into effect and required all auto insurance carriers to pay all physicians, hospitals, and health care providers when they treated a patient for an injury related to a car accident regardless of who was at fault. Michigan is not the only state to make no-fault PIP coverage mandatory for drivers—there are a total of 12. Michigan is, however, the only state with an unlimited cap on the no-fault PIP coverage. Per the current PIP coverage in Michigan, when an injured party receives medical care due to an auto accident, health care providers charge the injured party's auto insurer the reasonable and customary rate for services. This "reasonable and customary rate" is generally significantly higher than what health care providers might charge Medicare, where a fee schedule is followed that indicates lower costs for similar care. Take a look at the avg. cost per PIP claim (Below) in Michigan compared to all other states that also mandate no-fault PIP and try to explain why changes to the PIP system would not solve the crisis in Michigan. It's important to note, in other states with a limit on the amount an auto insurer is charged by health care providers for a PIP claim, injured parties are not left to cover the costs of their medical care themselves and they are not restricted from receiving proper medical care. Massachusetts, for example, has successfully adopted a no-fault PIP system with a cap on how much health care providers can benefit from auto insurers. For example, after the Massachusetts PIP cap of $8,000 is reached, one of two possible options kicks in to cover the rest: 1) the injured party's health insurance becomes liable for payment; or 2) the injured party sues the negligent driver and the negligent driver's auto insurance pays for the treatment. It's clear the problem is Michigan's no-fault PIP. AAA explained that the amount (or frequency) of PIP claims it sees in Detroit is two to three times greater than in surrounding communities and the average cost (or severity) of a PIP claim is about double. The data from Independent Statistical Service, Inc. (ISS) shows something similar. This means auto insurers pay more and larger claims in Detroit. Many people have a health insurance policy through their employer or Medicare/Medicaid and, thanks to the Affordable Care Act (ACA), more people have access to their own policies through the health insurance marketplace. This means many Michigan drivers are already paying for hospital and emergency care via their health insurance policies. Why are they forced to pay for duplicate coverage in the form of unlimited PIP with an auto insurance policy? D-Insurance will offer another option to Michigan drivers, allowing them to choose the amount of medical care coverage they want in addition to what they already pay for with health insurance. In the event a Michigan driver is unemployed and opted not to purchase health insurance per the ACA, it's most likely because they could not afford the insurance. D-Insurance will offer auto insurance at a more affordable rate, allowing these drivers to obtain medical care coverage in the event of an auto accident when they otherwise may not have had the financial means to do so. The unlimited no-fault PIP system in place has created an environment that is detrimental to both Michigan drivers and auto insurance companies. An unlimited PIP cap means that health care providers bill auto insurers for 100% of the medical care given to injured victims of car accidents. The medical care for treatment of injuries relating to auto accidents is typically charged at the regular and customary rate, as opposed to the agreed upon fee schedules physicians negotiate with health insurers. AAA provided several examples of the relative costs of medical procedures performed on auto accident victims. Under the no-fault unlimited PIP system, the procedures for injured drivers in Michigan are billed at a significantly higher rate than similar procedures billed through Medicare or Worker's Comp. Look at the amount charged for an MRI in Detroit if it were billed to an auto insurer per the driver's PIP coverage and compare that to the same MRI if it were billed as a Medicare or worker's compensation claim. This is a clear example of the overcharging of auto insurers by health care providers. The current system also leads to fraud when physicians charge auto insurance companies for services they did not perform or that were performed, but had nothing to do with the injuries sustained in an auto accident. The result is auto insurers pay $1.28 in claims for every dollar of premium collected for PIP coverage in Detroit. This 28% loss on PIP coverage with every policy makes providing insurance in Detroit unprofitable for insurers. Introduced by Michigan State Senator Virgil Smith and supported by Detroit Mayor Mike Duggan, the proposed bill will provide for very important changes to the current PIP system in Detroit. Detroit is important because it was and can be a symbol of accomplishment for the state of Michigan. In the 1960's, Detroit was considered an icon of Industrial America. In order for Michigan to regain its status as a successful economic model, it must start with Detroit. One crucial problem with reinvigorating Detroit is that businesses depend on a bustling population. Detroit's current population is a mere 40% of what it was in the 1960's. If people cannot afford to live in Detroit because the price of their auto insurance exceeds the cost of their rent, it will not prosper. The first element of the revised PIP system pertains to the unlimited cap on PIP coverage. D-Insurance would create an additional PIP option for Detroit drivers: stick with the unlimited cap or, for a lower auto insurance rate, select a $275,000 per accident PIP limit. This means health care providers can only bill auto insurers up to $275,000 ($25,000 plus an additional $250,000 for necessary critical care) for medical care related to auto accident injuries. Medical care exceeding the $275,000 limit can then be covered by other means, such as the driver's health insurance. Virtually all treatment provided after the cap has been met would follow a fee schedule agreed upon by health insurers and health care providers. The second element involves creating a pool of trusted health care providers, excluding emergency services. This preferred provider network would reduce the number of fraudulent claims submitted to auto insurers by ensuring the medical care provided for injured parties was medically necessary and pertained only to the auto accident for which the claim was submitted. There would also be a level of pre-authorization required. Additionally, a fee schedule would be implemented, similar to that currently used between health care providers and Worker's Comp claims to create a more balanced system. A cap on the no-fault PIP system and a program of approved health care providers with a fee schedule in Detroit will ultimately provide drivers with an affordable option for auto insurance and help alleviate a major setback in Detroit's revival. One prominent group in opposition of D-Insurance is the Coalition Protecting Auto No-Fault (CPAN). It's important to note, CPAN was founded by a large number of health care groups—the very organizations who directly benefit from the current, dysfunctional PIP system. CPAN has published information that attempts to scare Michigan drivers into thinking that a reform to the current PIP system will jeopardize the health care they would receive in the event of an auto accident. They are trying to keep Michigan in the dark ages instead of supporting Michigan's attempt to grow and revitalize. "Passing this law would result in injured drivers receiving substandard medical care or be left to pay for medical care themselves." Right now, studies indicate that Michigan physicians who treat drivers with car accident-related injuries charge auto insurance companies up to 400% more than similar physicians rendering the same treatment in Pennsylvania and New Jersey (two largely populated and no-fault states). Why? Because they can. With a PIP cap, physicians in Pennsylvania and New Jersey collect additional medical expenses from health insurance companies which use negotiated fee schedules and prevent over billing. If Pennsylvania and New Jersey physicians provide similar care for such significantly lower costs, why shouldn't Michigan physicians be held to the same standards? Reducing the PIP cap will not result is a lower quality of care, it will result in lower costs for the same care. Perhaps just as important, injured parties would not be left to cover the costs of medical care themselves. Many Michigan drivers are already paying for hospital and emergency care through their health insurance. The medical care an auto insurance policy covers in the event of an accident is redundant. A lowered PIP cap would mean drivers could pay less for auto insurance while retaining the coverage they already also pay for through their health insurance. In Massachusetts (and other no-fault states for that matter) for example, once the PIP cap of $8,000 is reached, one of two possible options kicks in to cover the rest: 1) the injured party's health insurance becomes liable for payment; or 2) the injured party sues the negligent driver and the negligent driver's auto insurance pays for the treatment. "Passing this law would result in 'second-rate' car insurance for drivers in Detroit." This law would not affect the quality of auto insurance offered to Detroit drivers. Instead, it would introduce a new option for drivers in Detroit. D-Insurance would allow a cap on the amount payable by your auto insurance company to health care providers as well as make available a trusted group of health care providers who would follow a fee schedule to charge for medical care related to auto accidents. The PIP cap—$25,000 per accident, with an additional $250,000 in cases of necessary critical care—is 500% higher than the current cap offered in the no-fault state of Pennsylvania. To put this in perspective, take a look at the current caps for amounts payable by auto insurance companies in the 12 no-fault states. If you are worried that a $275,000 cap in PIP benefits would be catastrophic to the state of Michigan and unfair to injured drivers, talk to your friends and family members in Pennsylvania, Massachusetts, Florida, or in virtually any other no-fault state. Ask them whether their PIP coverage is an issue. Or simply scan the news in those states to see if they are suffering through an insurance crisis—or if there are any concerns whatsoever about the amount of PIP coverage provided by their insurers. Michigan is truly experiencing an auto insurance crisis as shown in the chart below. Michigan possesses the highest average claim amount (severity) in the country with over four times the national no-fault average. Detroit, specifically, is even worse with a claim severity of $59,000, nearly 320% higher than New Jersey. And with the second highest uninsured motorist rate shown, at 21%, it's time legislators made a positive change for the drivers of Michigan. In addition to Michigan State Senator Virgil Smith and Detroit Mayor Mike Duggan, Detroit has another supporter, CURE Auto Insurance. Headquartered in Princeton, NJ and founded in 1990 by New Jersey Insurance Commissioner James J. Sheeran and award-winning insurance expert Dr. Lena Chang as an answer to the insurance crisis in New Jersey, Citizens United Reciprocal Exchange (CURE) continues to lead the way as the not-for-profit solution for responsible drivers and the "cure" for the continuously evolving auto insurance problems. From 1972 until 1990, New Jersey’s no-fault Personal Injury Protection (PIP) cap was unlimited, like Michigan’s today, and the cost of claims were crippling. However, in 1990 New Jersey finally changed the unlimited no-fault laws and adopted a $250,000 PIP cap and CURE (formerly NJ CURE) was founded by my family. CURE has successfully operated in the difficult New Jersey personal auto insurance market for over 25 years and intends to provide the residents of Metro Detroit with the same opportunity to purchase affordable auto insurance. CURE is able to offer quality coverage at an affordable rate to responsible individuals who may not otherwise be able to afford insurance because of its unique business model. Unlike other insurers focused on long-term profitability, CURE functions in a not-for-profit manner and does not have to satisfy shareholders at the expense of its members. Any unused premiums—or "profits"—are used solely for the benefit of its members and are realized in the form of lower rates. CURE also does not use agents to sell policies so members aren't paying commissions as part of their premium. As a New Jersey auto insurer, CURE exists in an environment with the next highest PIP limit (See table below), just behind Michigan. One reason why CURE is able to keep rates at a reasonable level is due to their aggressive pursuit of fraud. 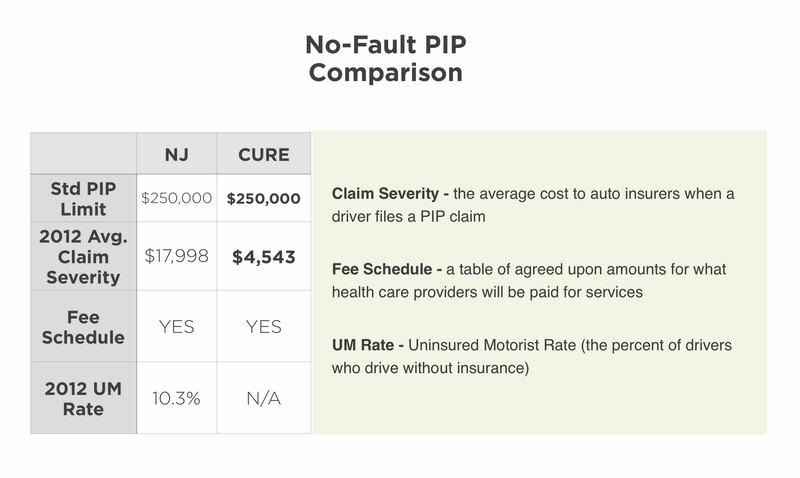 This comparison shows CURE's average PIP claim payout in 2012 was almost four times less when compared to the state of New Jersey as a whole. CURE takes fraud very seriously and, as a result, is able to keep fraudulent claim payouts at a minimum and pass the savings onto drivers. Another unique quality of CURE is its refusal to adopt discriminatory rating factors—the information about a driver used to determine the rate they will be charged for auto insurance. CURE cares more about how a person drives then about their social or economic status, so, unlike other insurers, it uses factors that reflect a person's driving history. The factors that most other insurers use (credit score, education level, occupation, and home ownership) can increase insurance rates by as much as 50% and have nothing to do with a person's driving ability. After 25 years of success in New Jersey, CURE is more than qualified to bring affordable, quality auto insurance to the drivers of Detroit. Please review the letter that will be sent to your selected representative(s) and click submit at the bottom to send. I am writing to ask that you support D-Insurance. Michigan is truly experiencing an auto insurance crisis with astronomical premiums and the fifth highest uninsured motorist rate in the country. We need the affordable auto insurance that D-Insurance will provide. The attached chart illustrates the severity of the situation in Michigan. Please do your part to make a positive change for the drivers of Michigan. I appreciate your help and thank you for your time. Thank you for supporting D-Insurance.